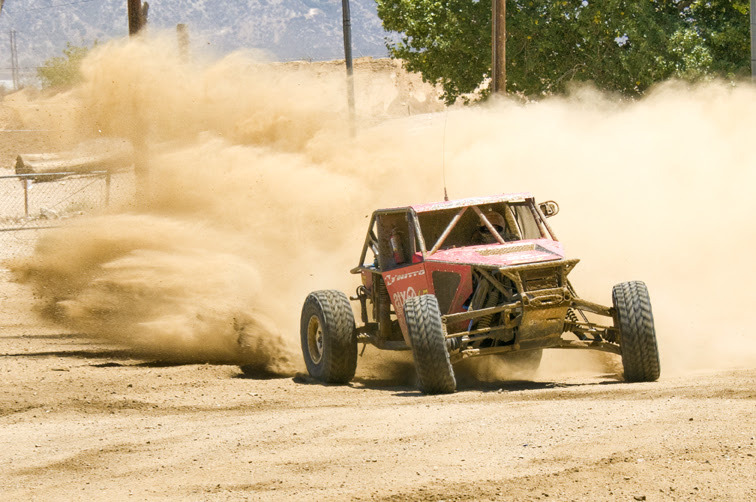 GLEN HELEN, CA – JULY 12th, 2014: Over 115 race teams descended upon Glen Helen Raceway the weekend of July 11th for the 4th annual 4 Wheel Parts Glen Helen Grand Prix. With nearly triple the car count of the inaugural 2011 race, the competition was fast and fierce for all classes. However, one driver stayed at the front of the pack all weekend and that was the current King, Loren Healy. Healy couldn’t get too far in front though, as Levi Shirley was close on his tail at every turn. ATX Wheels and Nitto Tire driver Healy had the fastest qualifying time on Friday in his brand new Jimmy’s 4×4 Independent Front Suspension (IFS) car. Healy started on the pole in the first prelim and maintained his lead all day Saturday. The only time Healy wasn’t in front was during a brief pit stop for fuel, and even then he had re-gained the lead from Levi Shirley before the start of his next lap. Levi Shirley, who has raced four ULTRA4 races on two continents in the last five weeks, including a first ULTRA4 win in Italy, won his prelim Saturday morning and started the main event just behind Healy. Shirley maintained a fast and consistent 2nd place throughout all 20 laps of the main event. The battle for 3rd was the tightest podium battle in the main, with Jake Hallenbeck starting off in 3rd and maintaining his position for most of the first half of the race. On the 10th lap, Hallenbeck was overtaken and fell back to 4th and a few laps later to 5th behind Kevin Sacalas and Wayland Campbell. Wayland Campbell was in 3rd going into the final lap, however Hallenbeck was able to charge hard and overtake Wayland in the final minutes of the race and clinch the 3rd place podium for the second time in two races. In addition to the unlimited 4400 class, Glen Helen was also the largest regional race to date with more than 40 limited class vehicles registered. All ULTRA4 classes competed at Glen Helen including the 4500, 4600, 4700, 4800 cars as well as UTVs. In the 4700 spec class, Red Bull Athlete, Wes Agee took the win, with Jessi Combs following up her Stampede win with a 2nd place finish with Chris Ridgway finishing in 3rd. With more than 15 4500 cars registered, this was the largest regional race to date for the Rubicon Express Modified class. 4580 Jordan Townsend lead in both prelims and the main event for the class and repeated his Stampede performance with another win over 2nd place John Currie in the 88 car, with 3rd place going to 4531 Shawn Rants. For the 4600 ProComp Stock Class, 4612 Ben Varozza also claimed his 2nd win in as many races, followed by 4648 Brian Behrend and 4696 Sean McNamara. Richie Carter won the 4800 legends class in his first regional event for this class with Richard fenton coming in 2nd and Hans Oswald claiming 3rd place on the podium. For the UTV Sportsman Class, 1927 David Harvick won with #3 Darren MItchell coming in 2nd and 1902 Jon Nelson taking 3rd. The next ULTRA4 race will be King of The Valleys in Wales, UK the weekend of August 8th – 10th. The final race in the Trail-Gear Western Regional Series will be the American Rocksports Challenge August 22nd and 23rd in Tooele, UT and the final race in the 4WD Hardware Eastern Regional Series will be the Sturgis Off Road Blowout in Sturgis, KY on September 12th and 13th. The Nitto National Championship will be held October 17th and 18th. Keep an eye out for details in the coming weeks.